The Glamorous Life of a Housewife: Treats for Tiny Hands. My mother-in-law had surgery the other day, so my sister-in-law and her little boy flew in to be with her and help out for the week. 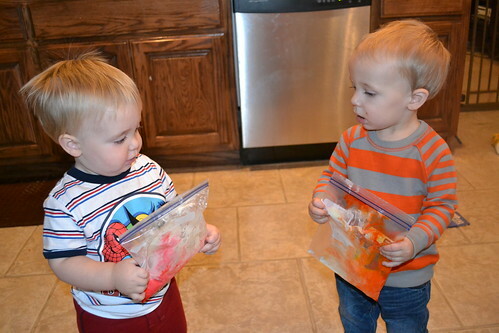 During the surgery, I kept her son (Levi's cousin) and they had so much fun playing together. 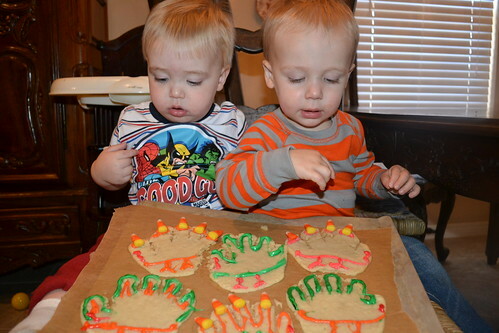 I thought it would be fun to make a little Thanksgiving "craft", and though it didn't turn out exactly as planned, it was so very special and a lot of memorable fun! 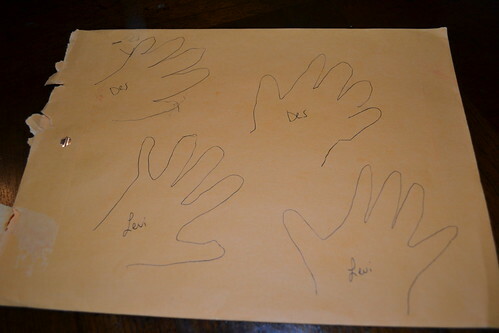 First I traced their little hands. 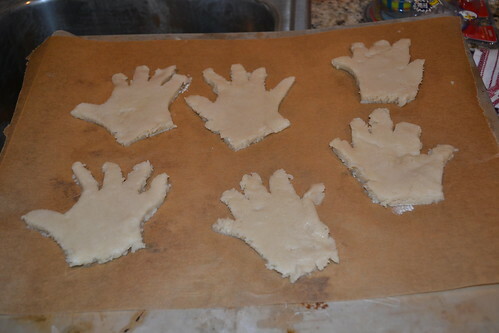 After I cut their handprint out from the paper, I traced them in sugar cookie dough and placed them on a baking sheet. 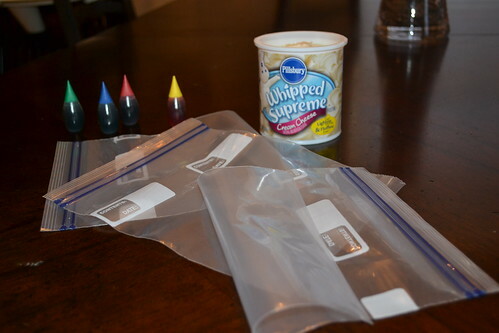 Threw some store bought icing into separate zip lock baggies and added some food coloring while the cookies were baking. 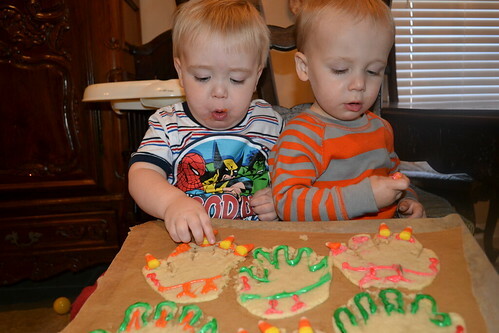 The boys weren't quite sure what to think. They were more interested in drumming on the chairs. Ummmm.. So. 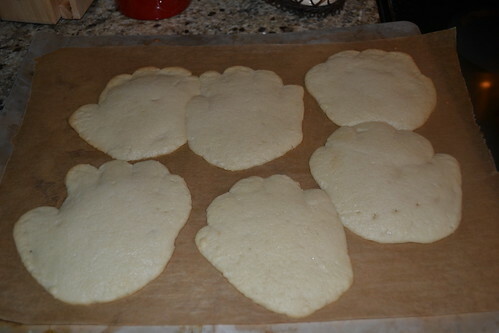 During the baking process, the handprints spread ... into giant bear paws. I had to get a knife and cut so the fingers would show. 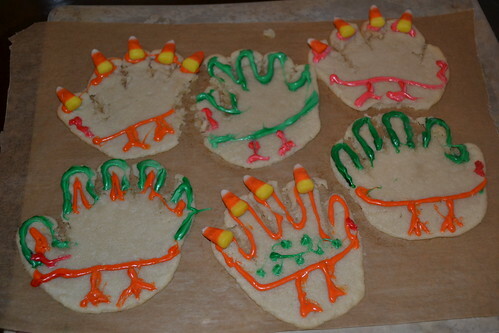 Because, we were making turkeys! "Mom, these don't look like the picture we saw online." We took one of Levi's hand and one of Des' hand and brought them to Grammy at the hospital for a "get well soon" gift. She loved them. As only a Grammy could. 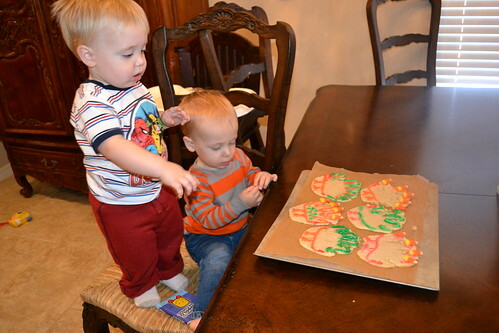 The boys were more interested in eating the cookies than decorating them. We also made these. They were much easier. Love the pictures. 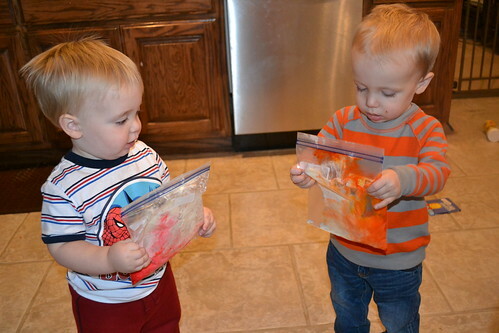 Their expressions in the ones where they are holding the bags of frosting crack me up! How fun your day must have been. Ready for baby #2? OMG!!! 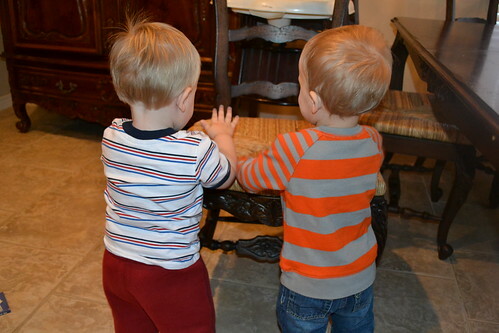 Those boys are the cutest darned things... I love the second pic of them, and how Levi's cousin is glancing over at him... hilarious!!! What a fun project Whitney!! hehe!! Hahaha! Love this. I love the "These don't look like the pictures online" picture! Adorable. I love the caption saying these don't look like the pictures. hahahaha. They are very cute! LOVE where they're stealing the candy corn. So cute. cute! 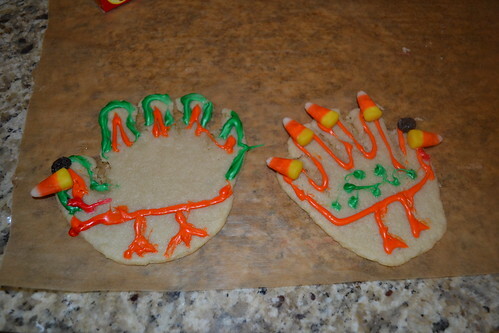 I love the turkey hands! they are just adorable! Those boys are so cute!! 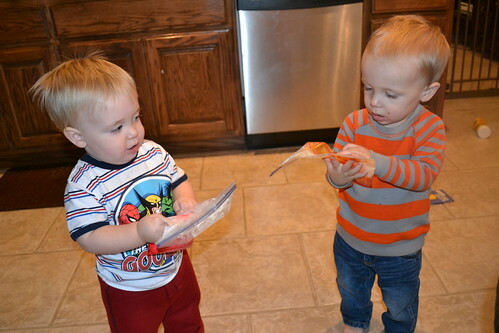 I love the way they are looking at the plastic bags and then the way Levi was looking at the cookies. SO cute! Sooo cute!!... I hope your family and you have a great Thanksgiving! 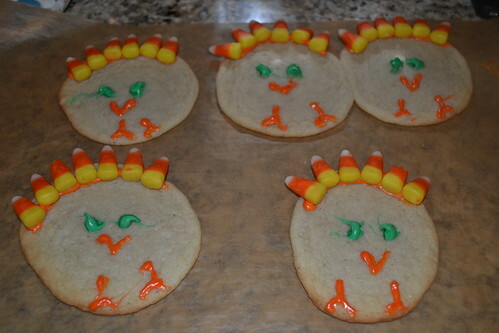 What a fun Thanksgiving idea! The boys looked like they were having a blast. What a great idea. And very cute! The boys look so adorable in the pictures! I couldnt help but burst out laughing when the pawprint picture came up. Girl, we have all been there. I love this craft! Too cute!!! 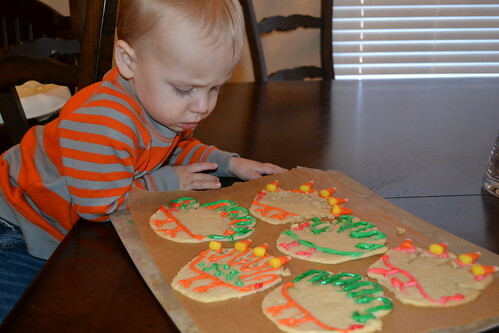 Those cookies look awesome, next time you may want to look up the No Fail Sugar Cookie recipie. Those cookie do not spread while baking.